Magnificent jewels are set to sparkle and shine at Christie’s New York Spring sale – an auction which is expected to exceed $40 million. A four-strand natural colored pearl necklace measuring from 12,65 to 4,90 mm. Estimate: $3,800,000 – 4,500,000. Three Strand Nina Dyer Black Pearl Necklace, Cartier. The triple-strand natural black pearl necklace, is made up of 151 spherical and near-spherical, perfectly matched natural black pearls. The Cowdray Pearls. Composed of a single row of thirty-eight graduated natural grey pearls, measuring 11.4-6.8mm, to the rectangular mixed-cut diamond clasp, 43.2cm long. A pair of Art Deco natural pearl and diamond bracelets. Estimate $120,000 – 150,000. A sapphire and diamond necklace, by Graff. Estimate $250,000 – 350,000. A pair of emerald, diamond and colored diamond ear clips, by JAR. Estimate $250,000 – 350,000. A sapphire and diamond necklace, by Van Cleef & Arpels. Estimate $300,000 – 500,000. A pair of D-color diamond ear pendants of 10.06 and 10.02, by Harry Winston. Estimate $1,500,00 – 2,000,000. A fancy intense purplish pink diamond of 5.29 carats. Estimate $3,500,000 – 5,000,000. A pair of cushion-cut diamond ear pendants of 10.28 and 10.42 carats. Estimate $600,000 – 800,000. 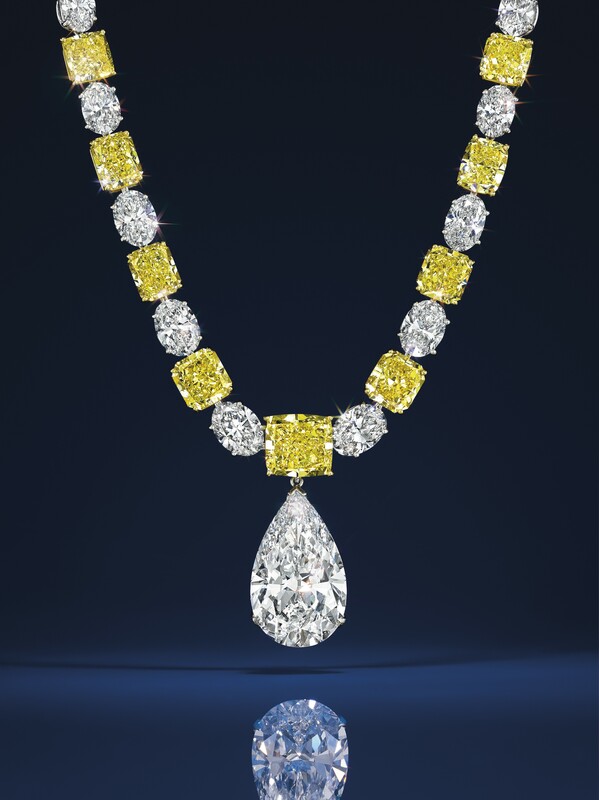 A colored diamond and diamond necklace, by Graff. Estimate $500,000 – 700,000. A pear-shaped D-color potentially internally flawless diamond pendant of 25.49 carats. Estimate $2,500,000 – 3,500,000. A cushion-shaped diamond of 80.73 carats. Estimate $4,000,000 – 5,000,000. A circular-cut fancy gray-blue diamond of 5.04 carats. Estimate $1,750,000 – 2,500,000. A cushion-cut D-color potentially internally flawless diamond of 11.03 carats, by Graff. Estimate $750,000 – 1,000,000. An octagonal-cut Kashmir sapphire of 11.88 carats. Estimate $1,200,000 – 1,800,000. A superb emerald, ruby and diamond necklace, by Bulgari. Estimate $300,000 – 400,000. After a record-breaking year in 2014 in which Christie’s Jewellery Department realized an unprecedented $754.7 million in sales, we are proud to begin the jewellery auction season with this exceptional sale of Magnificent Jewels in New York. The auction on April 14 is comprised of superior quality diamonds, rare colored gemstones, and natural pearls that present collectors remarkable opportunities to acquire one-of-a-kind rare jewels. Post by Claudia Carletti, Jewellery Through Time. Material courtesy of Christie’s Press Office.